MyCRM Blog | How CRM software can help manage a company’s sales pipeline, when you know what it is! CRM that is! From years of experience in the CRM market place I have come to realise, and some may disagree that CRM means many different things to many different people even when they are from the same organisation. I recently spent time with an organisation where the Sales Director sat across the table and clearly stated that “CRM is rubbish and it is all make believe and as an organisation we don't needed any of it!”. My obvious response was just to smile and then, I asked why he thought that was the case. After a very short demo of the sales process in Microsoft Dynamics CRM and an explanation that sales are made to customers I had a new “Raving Fan” on my hands, a "convert to CRM". This was not because the demo I had given was the best ever demo but clarification of how CRM can help in that department in that instance i.e. managing sales opportunities had opened the door to other discussions on how CRM could be used within the organisation. In this post I look at how a tool like Microsoft Dynamics CRM can be used to manage a Sales Pipeline out of the box. To any Sales Manager or Director the management of closed and open sales opportunity is key to meeting targets and here I look at how CRM does this effortlessly. A lead record can be captured from many different sources including Social, Web, Phone or Email but the details are always the same, with the idea being that the individual is interested or may be interested in the products and services offered by your organisation. Once a new lead or prospect has been added to your CRM then you should have a standard business process on how you want to contact that person. This may include email marketing, an introduction email, a phone call or some other interaction but this should be recorded at the lead or prospect level. Understanding Prospect to Customer Status. The next stage is to understand the best time for your business to convert the new lead to a customer, and it most cases this is when a number of process have been completed in CRM to qualify the Lead Prospect with the right information. 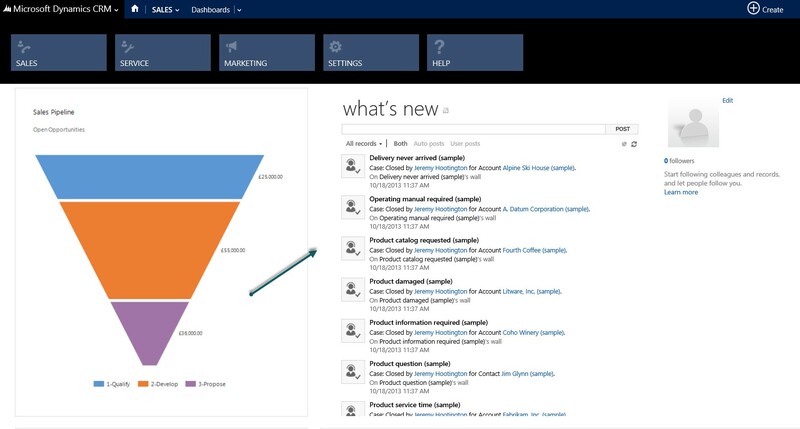 One of the great new features in Microsoft Dynamics CRM 2013 (see Screen shot above) is the help to qualify process which has 4 key steps from Qualify to Close. This new easy to use process helps deliver lead / prospect creation, qualification, development, proposal and completion to an active pending customer. The activity feed in the centre of the screen shows the real time status of activity for the customer record which has been converted from the original prospect or Lead record. Once the initial leads have been generated, it's important for the sales staff to be able to manage the follow-up communications effectively. Fortunately, the CRM software means that information such as the action required, contact details and planned dates for the follow up can all be kept in one place, allowing for efficient communication between different sales staff. Needless to say, one of the key parts of managing the sales funnel is to ensure that all of the most relevant information regarding results is added to the database. Keeping this data enables a company to predict future sales results, meaning that relatively accurate sales forecasts can take place, enabling the business to optimise its planning and cash flow for the future. Microsoft CRM come complete with in-built sales forecasting reports and dashboards. The final key in terms of managing the sales pipeline is to ensure that the data used is analysed fully. If there is a particular path that has led to sales success in the past, then it can be followed again. Improvements to strategies should be made, and positive techniques put into action. This enables the company to demonstrate to the sales staff exactly why some processes are being used and others not. To find out more and to see why MyCRM specialise in delivering Microsoft CRM as a service contact us at www.mycrmgroup.com.